Experts believe that most forest fires are man-made and data corroborates this. Bengaluru: The forest fire at Theni in Tamil Nadu might stand out for its high fatality toll, 10 so far, but it is far from an isolated incident. The number of forest fires in south India has more than doubled in the past two years, and the main culprit is not higher temperatures but human beings. Forest fires do occur in the period from February and April, which marks the dry season. It’s, however, the growing number of such incidents in the forests of Tamil Nadu, Karnataka, Kerala, Andhra Pradesh, Telangana and Puducherry that has caused worries. Conservationist D. Rajkumar, who has worked for more than three decades in Karnataka’s Bandipur forest region, is quick to dismiss as myth the argument that forest fires can be caused by rising temperatures. Nature knows how to strike a balance. “If that were the case, why don’t our petrol pumps and clothing catch fire when the temperature soars?” asked Rajkumar, whose main effort as the managing trustee of the Wildlife Conservation Foundation in Bandipur has been to encourage a peaceful dialogue between forest officials and local agriculturalists. Apart from higher temperatures, there are other theories at work too. One of them blames forest fires on lightning. However, experts clarify that lightning is always followed by rains, which would douse any spark caused by the bolt striking a dry tree. Another is centred on friction between bamboo trees and grass. The ensuing spark, if stoked by strong wind, could start a big fire. But south India does not have that kind of heavy bamboo vegetation. To believe it to be the cause “is nothing but foolishness”, Rajkumar said. A.K. 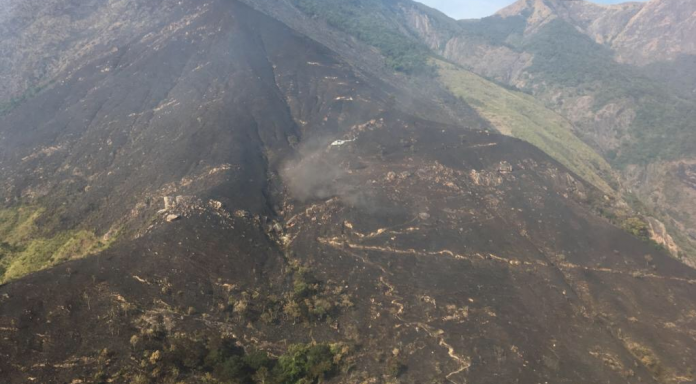 Varma, a former principal chief conservator of forests for Karnataka, said he knew the Theni inferno wasn’t accidental the moment he saw photographs of the scene. “Ninety per cent of the time, the fires are deliberately set. The photographs that I have seen of the Theni fire, for instance, it was burning in one straight line. I have seen these kind of forests, and it shows that this is typically a case of mischief,” he added. “The forest department has always been careful, but one cannot ignore the fact that the Theni fire was caused by miscreants…” he added. Since 2015, Kerala, Karnataka and Tamil Nadu have in particular faced severe forest fires that officials have struggled to bring under control. In Kerala, the number of forest fires has risen 401 per cent since 2015, from 91 to 456; 350 per cent in Karnataka, from 295 to 1,333; 216 per cent in Tamil Nadu, from 95 to 301; 74 per cent in Andhra Pradesh, from 1,075 to 1,877; and 66 per cent in Telangana, from 1,052 to 1,154. The Union territory of Puducherry has seen nine fires since 2015, which recorded none. Experts believe that almost all forest fires are man-made and there is data to back that claim. But are they all deliberate, arson? There have been several skirmishes between locals living in and around forests and officials over refused permission to cut firewood and graze cattle, as also illegitimate claims to the land. “Many retaliate by setting dry areas on fire to create fear and confusion among people…this way the forest department would be pressed into action and (it) could even lead to large-scale catastrophes,” said Praveen Bhargav of Wildlife First, a conservation advocacy organisation. However, the cause could just as easily be a lit cigarette casually tossed onto a bed of dry leaves. Or a camp fire that wasn’t carefully monitored. The interiors of forests are drawing more and more adventure enthusiasts as the passion for trekking gains ground. Bhargav said that people should be concerned about our natural habitat. “It’s lovely to go to a forest and try to de-stress. Have a camp fire, spend the night in the wilderness. But then, before one leaves, do we put out the fire in a systematic manner? Do we think of the consequences?” he said. What many people also don’t realise is that timing could mean the difference between life and death. Conservationists have made it clear that trekking should be off-limits in south India in the dry months from February to April. Bhargav observed that, like in Theni, trekking expeditions were often undertaken without permission from forest officials. “Going on a trek without trained personnel is like handing over a bus to an untrained driver and putting 50 lives at risk,” he added. In December last year, the government informed the Lok Sabha that 64 per cent of India’s forest area was prone to fires. Discussing measures to deal with forest fires, it said the Centre had prepared a crisis management plan (CMP) to tackle them quickly. But the question that remains is, with these fires’ potential to destroy the local ecosystem and imperil human lives, will the act of setting them be made a criminal offence?